American RV motorhomes are no more special than any other vehicle on the road regarding their braking components, they have a brake master cylinder, brake discs, or to use the American terminology brake rotors and brake pads. They do have a different method of adding extra force to the brake fluid than some of the vehicles that you may be used to. A car uses a brake servo to multiply the force you apply to the brake pedal with your foot, the brake servo contains a large diaphragm. The petrol engine produces negative pressure known as a vacuum. This vacuum acts on the brake servo diaphragm multiplying the mechanical force on the brake pedal which in turn increases the brake fluid pressure. This brake fluid pressure is used to apply the brakes. 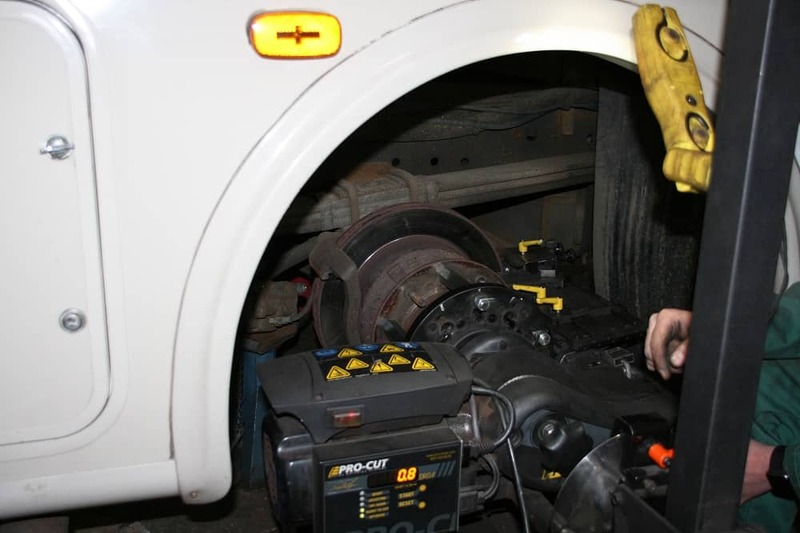 The large goods vehicles (LGV) use air pressure to apply pressure for the braking system whilst an American motorhome uses a component called a hydro boost. What the hydro boost does is use the hydraulic pressure generated from the power steering pump to increase the brake pedal pressure. Some of the Ford and Workhorse chassis that a majority of the American motorhomes are built on are a derivative of a commercial chassis that is built to do many miles and is in constant use. This is what an American RV motorhome chassis does not do, especially here in the UK. The knock on effect of this is that the motorhome spends a lot of its life stationary which is the main cause of the braking problems. What I will do now is explain what has been going wrong and why. The first thing to make you aware of is the brake pad quality. Brake pads that are used by Ford and Workhorse as original equipment are good quality but are not the best as they tend to deteriorate from use when extended sitting occurs (typical motorhome use). The moisture in the air and situations such as having the motorhome parked on the grass for extended periods would encourage the brake pads to stick (rust) to the brake rotor. What can happen in extreme cases is the brake pad will form a firm bond with the brake rotor, then when the wheel moves the brake pad material stays attached to the brake rotor pulling the brake material away from the backing material. In less serious cases the brake pad starts to fracture and disintegrates leaving less surface area for braking, this can cause excessive heat build-up on the rotor. Another problem that occurs regularly is the seizing of brake callipers. Brake fluid is used to operate the callipers on the braking system. The driver’s foot applies pressure to the master cylinder piston which then multiplies the pressure using the hydro boost which was mentioned earlier. Brake fluid acts on the calliper piston increasing the mechanical pressure once again to the brake pad. This interaction between pistons and brake fluid works perfectly as long as you have no air in the brake fluid system. When the fluid gets too hot it will boil inside the brake pipes, if you boil the fluid you get steam and this steam is a gas. Gas is air and this is why when you experience brake fade the pedal goes to the floor. You are compressing air not fluid and the air not being as dense as the fluid allows the brake pedal to reach the floor. If you pump the brake pedal up and down quickly you can often get resistance back in the brake pedal. Mineral or often called organic brake fluid is hygroscopic, this means it will absorb moisture and the moisture has a lower boiling point that the brake fluid. The dry boiling point of DOT 3 brake fluid is 205 degrees centigrade, the meaning of a dry boiling point is brake fluid that has just come from a sealed container. A wet boiling point is brake fluid that has absorbed moisture and the DOT 3 wet boiling point is 155 degrees centigrade, with the absorption of more moisture the lower the boiling point will get. This is why on the LAS service schedule we always take a sample of brake fluid from the brake master cylinder and in some cases will take a sample from the brake callipers. Next is the brake calliper problem, briefly mentioned earlier. The brake calliper pistons are made of a substance called Phenolic, the older readers may recognise the name Bakelite. Bakelite is a phenolic resin, it’s the same material the brake calliper pistons are made from. This phenolic resin is a very good heat insulator making it perfect for insulating the heat from the brake rotor to the brake fluid, as you now know what happens when the brake fluid gets too hot. Well, you would think it would be a perfect material for a brake calliper piston with its great thermal properties, this phenolic resin has a big drawback when it comes to vehicles that are not frequently used and that is phenolic resin absorbs moisture. Now if the vehicle is in frequent use the heat from the brake rotor would be sufficient in keeping excess moisture at bay, whereas a vehicle that frequently sits the phenolic resin absorbs the moisture from the surrounding air. As the brake pads wear more of the calliper piston is exposed, that coupled with the fact the brake fluid is hygroscopic and absorbs moisture makes the problem worse. Changing the brake fluid regularly and using the vehicle frequently is quite important. What happens to the phenolic resin calliper pistons when they absorb moisture? The answer is they become oval, not oval though to the naked eye. Just a few thousands of an inch is enough to cause the piston to tighten into the calliper bore and then this starts to hold the brakes on. Then a bit of a chain reaction occurs, by overheating the brake rotor and changing its molecular structure and colour will reduce the brake efficiency. 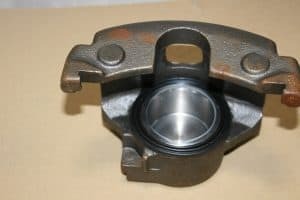 The brake rotors on an American RV motorhome are made from cast iron which is relatively cost effective to mass produce, they have good wear qualities and are somewhat heat resistant. 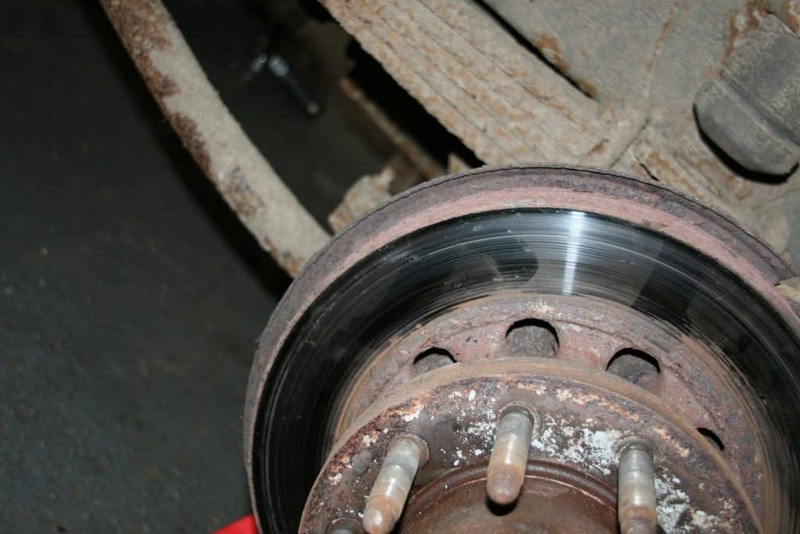 If the RV has been left as mentioned on damp ground for a while, the brake rotors will naturally start to corrode and if left for long enough can have a lasting effect on the surface of the rotor. When the brake rotor has got too hot the colour will change, it becomes blue and very shiny and feels like it has a slippery coating on it. Over time the flexible brake hoses deteriorate both internally and externally. Externally the rubber shows signs of cracking, the metal clamp used to clamp the rubber to the metal pipe connectors corrodes away. Internally the brake fluid brakes down the rubber pipe and restricts the brake fluids return to the master cylinder when the brake pedal is released. The reinforced structure of the rubber pipe can weaken allowing the pipe to bulge when the brake is applied. With these known faults LAS have done quite a bit of research and experimenting, not to mention capital investment to overcome some of these problems. What you now need is the conclusion and what we do to rectify these faults. Here at LAS, we have found that using severe duty brake pads instead of the original grade of brake pads used by the manufacturers has dramatically increased the brake efficiency of the vehicle which is a very good result. The early Chevrolet chassis RV used a single piston calliper that coupled with the original brake pads, very scary! Use of severe duty brake pads has increased the brake efficiency no end. That’s the good news, the bad news is we have been left with an annoying squeal when the brakes get hot. LAS have tried to eradicate the problem which has been vastly reduced but is still present. All other brakes have been fine, just the single piston Chevy’s are left with the annoying squeal. As we pointed out earlier the brake fluids moisture is checked on the yearly service that we do. Any sign of moisture in the fluid is found, the fluid is replaced from small sealed containers. The reason for the small containers of brake fluid is we never have any unsealed containers on the shelf if any is left over from a previous job we then dispose of it. Just a word of warning you should never use synthetic brake fluid in an American RV motorhome braking system as the synthetic brake fluid effects the hoses and the seals. With the problem of the caliper phenolic pistons becoming oval due to their ability to absorb moisture you might think that the obvious solution would be to fit steel replacement pistons, well that’s what I thought! The steel pistons are unavailable to replace the phenolic ones, even if they were you have to remember that the manufacturers have never produced the twin piston calipers with steel pistons, I can only presume the reason for this would be the heat transfer from the brake rotor to the brake fluid, though the steel pistons would be greater. The process of boiling the brake fluid might come a lot quicker and for that reason, we have to replace the caliper pistons, like for like. When the brake rotors go blue due to the overheating process the braking surface becomes very shiny. If you ignore this and just replace the callipers and pads, you will get vastly reduced braking effort. Then you would think the answer would be to replace the brake rotors, well no! 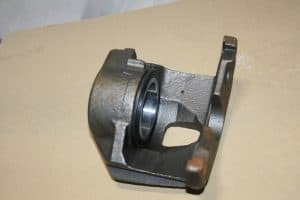 It can become expensive if you replace the brake rotors, take into account that you have the labour time and the additional cost of replacing the hub seals. 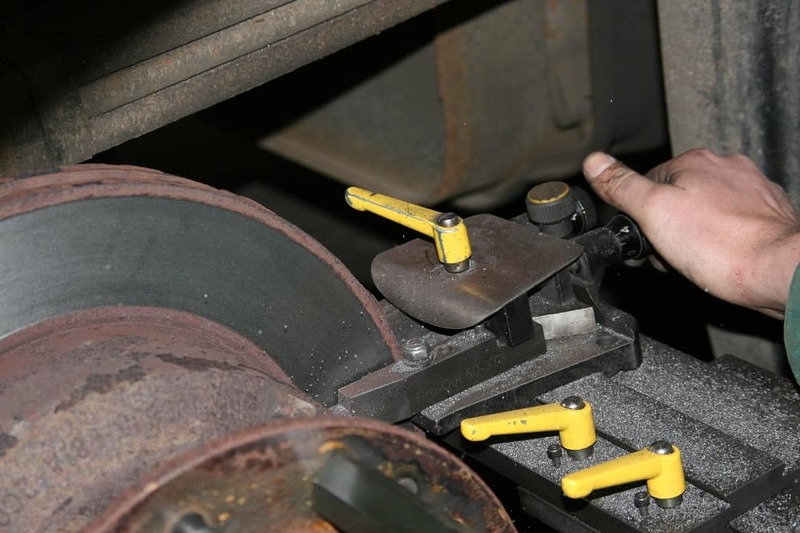 At LAS we can machine the brake rotors with the brake rotor still on the vehicle which will save you time and money. If the vehicle has a problem with its brake calliper then as a matter, of course, we at LAS consider that there is no practical or safety point in not replacing the flexible brake hoses. 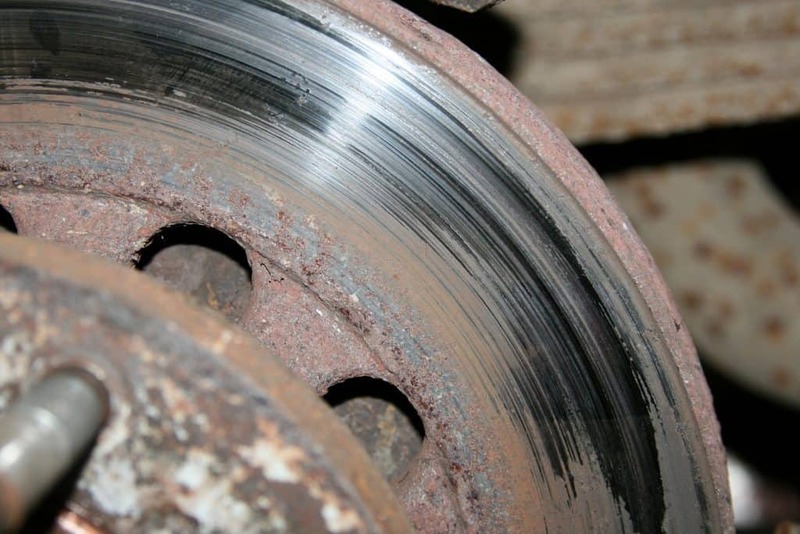 If the internal rubber has started to deteriorate then you might not notice it for a few months, you could end up overheating a brake rotor once again! If you have a brake problem or would like to book your American RV in for a service and a brake check call us at LAS Motorhomes on 01604 861999. LAS hope that this article has explained the importance of doing the work correctly and hope it has helped you to understand what and why things are done. Try to avoid mechanics working on your vehicle that are not specialized in American RV motorhomes, in a lot of cases you are paying for someone to learn how to fix the problem.